Are you an active sports lover out and about cycling, hiking or jogging in the open air? injuries that all too often result from high-impact games? Amazon's RUNNER FX SPORTS Leg Compression Sleeves Take Your Performance To Record Levels! designed, elastic shin splint sleeves! With the excellent support they offer to your legs, they enhance blood circulation, preventing leg cramps. prevent the expansion of superficial veins. Ward-off the hazard of tendonitis and stay HEALTHY! irritation. Try them, your legs will LOVE THEM! L/XL (13''- 16.5'') and are conveniently machine- washable and dried in the air. Rest Assured That Getting This Is Entirely Risk-Free! 30-Day Money-Back Guarantee! refund you. To us, customer satisfaction always comes first. 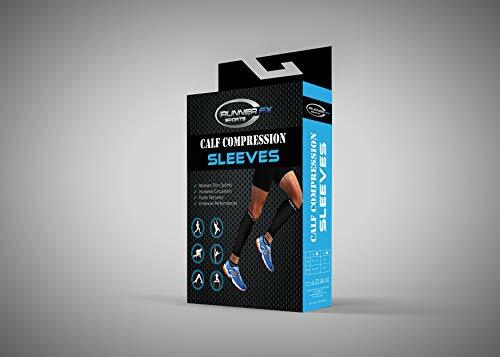 PURCHASE YOUR CALF COMPRESSION SLEEVES AND CLICK THE "ADD TO CART" BUTTON NOW WHILE SUPPLIES LAST!!
? 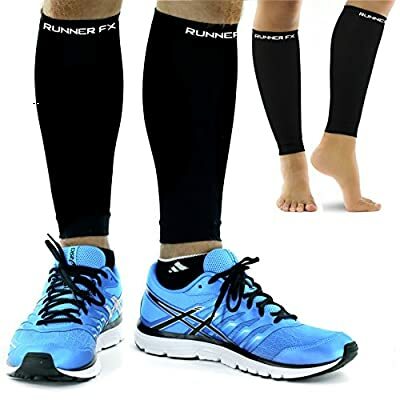 PROTECT YOUR LEGS - These scientifically designed calf compression sleeves are made of premium quality, breathable & durable compression fabric Nylon 76.6%, Spandex 23.4%. 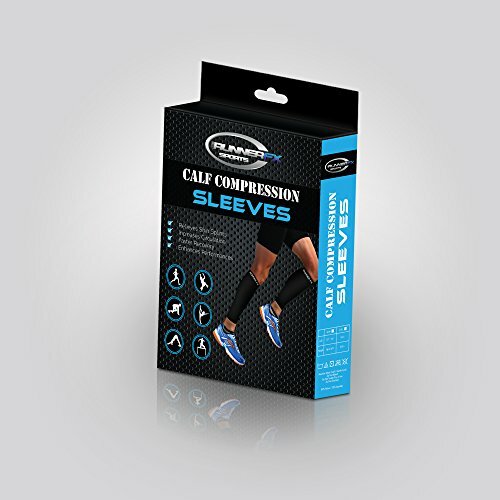 Our sleeves provide ultimate calf support, promote blood circulation, RELIEVE leg fatigue and REDUCE swelling. 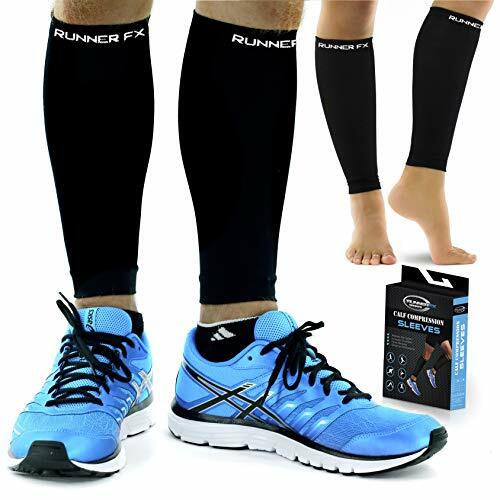 Unlike other suppliers, we at RUNNER FX SPORTS sell them as (1 PAIR) suitable for men and women alike. ? 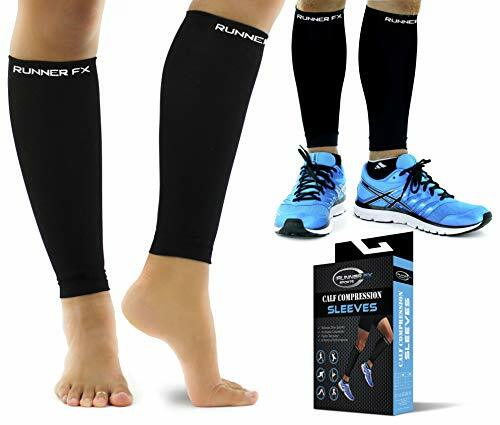 GET WELL SOON - Accelerate RECOVERY from shin splints and prevent leg cramps while working out in the gym or running, hiking, playing basketball or doing all sorts of demanding activities that require standing for long hours. ? THEY GIVE YOUR FEET WINGS - A must have for running, walking, cycling and all types of high- impact sports activities, as well as for people who are TRAVELLING or on their feet a lot, working in retail, hospitality or nursing field. ? TOP QUALITY - Our premium compression sleeves offer true graduated compression of 20-25mmHg. The NYLON + SPANDEX blend make our compression calf guard comfortably LIGHTWEIGHT and DURABLE. Our ergonomically designed shin splint sleeves compress the tissues under the skin and restrict the expansion of superficial veins. Choose from Small/Medium (calf size 11"-13.5"), or Large/Extra Large (calf size 13"-16.5"). ? 30-DAY MONEY-BACK GUARANTEE - Ensures your satisfaction. We don't just want you to try these sports leg sleeves, we want you to love them! In the unlikely event you are not positively thrilled with them, we will return your money in full.